Vitamin B1, a water-soluble vitamin also known as Thiamin, is an important part of the family of B-complex vitamins. The primary role this vitamin plays inside the body is in the conversion process of blood sugars into glucose as well as helping the body break down carbohydrates, proteins and fats. Sufficient levels of Vitamin B1 - Thiamin, also ensure that the nervous system and the cardiovascular system work optimally. Proper muscular functioning is also dependent on sufficient quantities of this vitamin. The production of adenosine triphosphate (ATP), which is the body's main source of fuel, could not happen without Vitamin B1. The heart in particular relies on this fuel supply so that it can keep up with its most important job of circulating blood throughout the body and supplying the blood cells with oxygen. 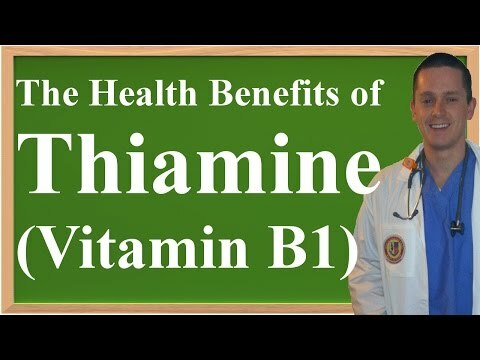 Because of its role in helping the heart pump blood, Vitamin B1 - Thiamin can possibly benefit those individuals suffering from congestive heart failure. Vitamin B1 can also be used to ease the numbness and tingling often associated with nerve damage. Because of the way this vitamin helps in the energy conversion and heart pumping processes, it has been known to boost mood and energy levels and alertness. Good sources of Vitamin B1 include pork, whole grain cereals, wheat germ, navy beans, kidney beans, garbanzo beans, peas, peanuts, fish, oysters, whole wheat and rye flour, oranges and orange juice and raisins. The best sources are found in beef liver and kidneys and in brewer's yeast. A determination as to the most beneficial daily intake of Vitamin B1 has yet to be made. However, since this vitamin is non-toxic, it really is not possible to consume 'too much'. Remember, as a water soluble vitamin, B1 is constantly eliminated from the body through the urine. Most experts agree that 1.5 mg each day is sufficient for men and women. As people age, it is natural for Vitamin B1 levels to start to decline. Aside from the natural deficiency brought about by age, Vitamin B1 deficiencies are very rare nowadays, but they do exist. Those who consume excessive amounts of alcohol are most adversely affected as alcohol inhibits the body's ability to properly absorb this vitamin. Babies that are given formula that lacks Vitamin B1 supplements can also be affected.